Is it juggling, or movement? Next year, we celebrate our big 70th annual festival in Cedar Rapids, Iowa. There are going to be a few changes and some surprises for next year in honor of this momentous occasion. Stay tuned for details coming soon after the new year! Our online eJuggle content continues to expand with Tricks of the Month, exclusive interviews, and members only content. We have a lot more lined up for next year, including new Tricks of the Month contributors, previously unreleased vintage juggling footage, festival videos and more! This year we also launched our long-awaited new website at www.juggle.org. The new site features a much more user friendly interface and modern design. Mind you, since we just recently launched, there are still a few technical kinks that we are working out, but we are extremely pleased to have this upgraded web presence. We capped off 2016 by bringing back our annual Video Tutorial Contest. This year, we had one of our most successful years to date and had entries from 15 different countries! Thank you to all of our sponsors and to everyone who submitted a tutorial. Click here to see the full list of this year’s entries. If you are in a learning mood, don’t forget that you can also go back through the years and check out all the contest entries from 2010, 2011, 2012, 2013 and 2014. This coming summer will bring the IJA’s 70th annual festival to Cedar Rapids, Iowa, July 10-17, and Festival Director Dan Holzman is working to make it a really memorable historic event. There will be the usual great shows and championships plus some new late evening shows and other events, as well as a number of special guests. Below are some tidbits about the 70th fest. Expect more details in the next eNewsletter and on the website over the next several weeks. The fest will have a Juggling History Museum with curators David Cain and Erik Aberg, with lectures given on “The history of juggling clubs” and “The life of juggler Paul Cinquevalli.” There will even be a late evening show dedicated to historical juggling tricks and rare juggling videos. Jay Gilligan will be a special guest and will perform a late evening show of experimental juggling with Erik Aberg. Jay will also lead three free juggling workshops on technique and creativity and will appear in the Cascade of Stars show. Erik will also be in the Cascade of Stars, and Jay and Erik will present a free lecture on “The Definition of Juggling”. In another late evening show, Peter Davison will perform his solo show “Tossed and Found”. In addition, he’ll lead three free workshops on movement and juggling and will be directing the Cascade of Stars. The fest will have a Juggling Coaching Lounge with an on-duty professional juggling coach utilizing video feedback to help jugglers learn new tricks and techniques. On Saturday there will be a Buskers Competition at the Cedar Rapid’s Farmer’s market. IJA hotel information will appear in next month’s eNewsletter and should be available from the festival website in mid January. When you arrive in Cedar Rapids, Iowa, in July for our historic 70th Annual IJA Festival, you will find a sparkling-clean, mid-sized, friendly, safe and welcoming Midwestern US city. The City of Five Seasons straddles the Cedar River, along the banks of which Cedar Rapids was founded as a trading, meatpacking and grain milling river town in 1849. It was named for the rapids that once disturbed the river as it moved through the city, and for the many red cedar trees that lined its banks. The river gave the new settlement life as it enabled trade, transportation and industry at the eastern edge of rich Iowa farmlands. As train, truck and highway transport supplanted riverboats and barges for most freight, Cedar Rapids diversified its economy and today is a vibrant metro area of about 130,000 people, with a mixture of light manufacturing and agricultural-related industry. Quaker Oats, Rockwell Collins, Maytag and Hy-Vee Foods are all major employers in the area. 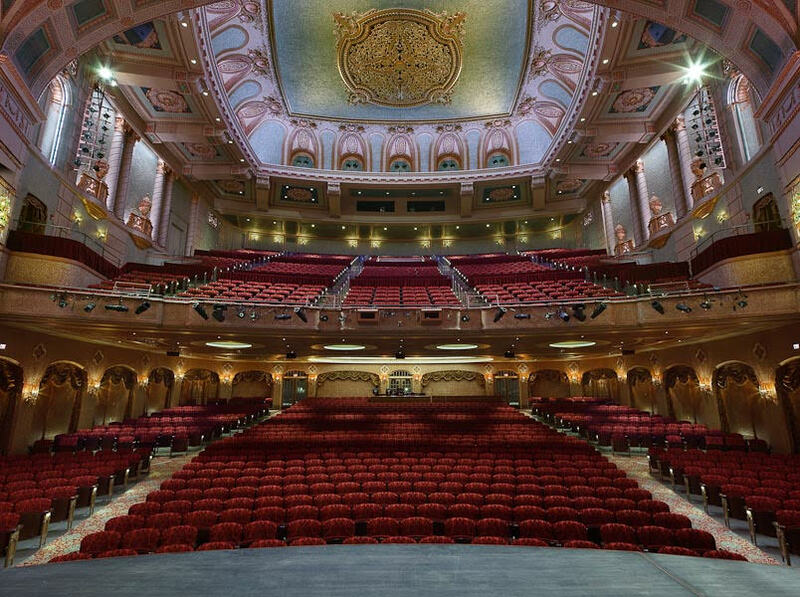 One of Cedar Rapids’ crown jewels is the Paramount Theatre, which will be the venue for four nights of public shows and world championship competitions during our festival. Originally built in the 1920’s as one of thousands of Vaudeville-era show palaces across the country, the Paramount opened its doors in 1928 as the Capitol Theater. The following year, Paramount Studios bought the theater, re-named it The Paramount Theatre, and operated it as the premiere live performance theater in eastern Iowa for more than four decades. But by the 1970s, the Paramount had fallen victim to changing tastes for live entertainment, and the needed upgrades and renovations were not made through the years to keep the venue attractive to touring or local shows. Paramount Studios gifted the theater to the city of Cedar Rapids in 1975, and a visionary group of citizen volunteers organized to restore the Paramount to its original glory and return it to its place as one of the most spectacular live performance venues in the Midwest. Over $400,000 was raised for that effort, and by 1980, the Paramount was again a stunning showplace and back on the schedules of major Broadway and national touring shows and internationally-famous acts of all kinds. Another round of renovations and upgrades was funded in the early 2000’s, and the theater underwent an extensive, $7.8-million upgrade. Updates included a 57′ wing space addition, new HVAC systems, new restrooms, existing restrooms renovation, new carpeting, new seat coverings, plaster work repair, electrical and fire system updates and the addition of the Guaranty Bank Reception Hall. Photos of the Paramount like the ones you see with this article show how indescribably beautiful and grand the Paramount looked after those investments. 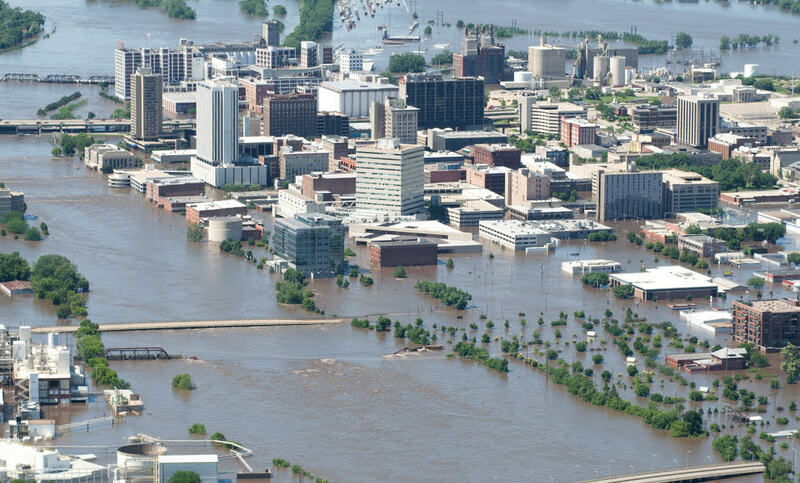 And then, in June of 2008, Cedar Rapids was decimated by one of the worst floods in the history of the state of Iowa — or anywhere in America. The flood inundated 10 square miles — 1,300 city blocks — of the city, including all of downtown and the Paramount Theatre. It flooded over 1,100 buildings, destroyed City Hall, 9 out of 10 fire stations, police headquarters, the city’s main library, four out of five water pumping stations, the city’s only convention hotel, the attached arena and the convention center. Fifty FEET of water covered several city blocks of downtown Cedar Rapids. The I-380 bridge was submerged under raging floodwaters, as were four other bridges across the Cedar River. River water covered downtown and nearby areas up and down the Cedar River, flooding 5-story buildings to their roofs. By the time the river returned to its banks a week later, 940 businesses and 5,200 homes had been flooded and mostly destroyed — more than 10% of the city — yet most Americans don’t know that this devastating flood in a sizable American city (the 2nd-largest city in Iowa) ever happened. Incredibly, no one was killed in The Great Flood of 2008. Among the most precious of all the buildings decimated by the Great Flood was the historic and spectacular Paramount Theatre. When the waters crested at 31.12 feet above major flood stage, the Theatre was inundated by approximately eight feet of water on the main level. The basement and sub-basement were completely flooded to the ceiling, and in all, over $16 million in damage was wreaked upon the historic theatre. The priceless 1920’s-era Wurlitzer Organ that thrilled and entertained generations of patrons was found upside-down on the opposite side of the stage when the water receded. Every seat, every thread of carpeting, every wire and cable, every light and production instrument in the theater was ruined. It looked like a total loss, and not one that could ever be rebuilt. But because they loved their city so much, the determined, hard-working people of Cedar Rapids rebuilt the city, almost entirely by themselves. As well, they built a new, gleaming all-glass main library, a new City Hall, five new fire stations (on higher ground) — and thankfully, they even fully rebuilt and restored the Paramount Theatre to its original eye-popping beauty. The people of Cedar Rapids considered the Paramount Theatre the heart of their city’s culture and arts community, and they wanted it back — even better than it was before the flood. A dedicated team of professionals rebuilt, restored and enhanced the Theatre and its amenities. As destructive as the flood was to the interior of the Theatre, the structure itself remained solid. This provided the opportunity to restore the Theatre’s historic features and create the upgrades and improvements today’s performers and patrons expect when attending events. After four years of work, the Paramount Theatre reopened in November of 2012, as the city continued to rebuild their downtown infrastructure. Along with giving a new life to the Paramount Theatre, the city built a new convention center and hotel, re-branding them as the U.S. Cellular Center and DoubleTree Hotel and bringing the hotel under the Hilton corporate flag. The U.S. Cellular Center and the DoubleTree Hotel will be our juggling home for festival week, with our evening shows and championships in the Paramount Theatre just 2.5 blocks away. In the cold and snow of January, 2014, after six years of rebuilding and three years of ongoing discussions with IJA, Cedar Rapids invited us to come and see all the wonderful things downtown Cedar Rapids could offer our jugglers. When we saw the beautiful, state-of-the-art facilities, the gorgeous new hotel and convention center — and of course, the spectacular Paramount Theatre — we signed up immediately to bring our 70th Annual festival to the city of Cedar Rapids in 2017. 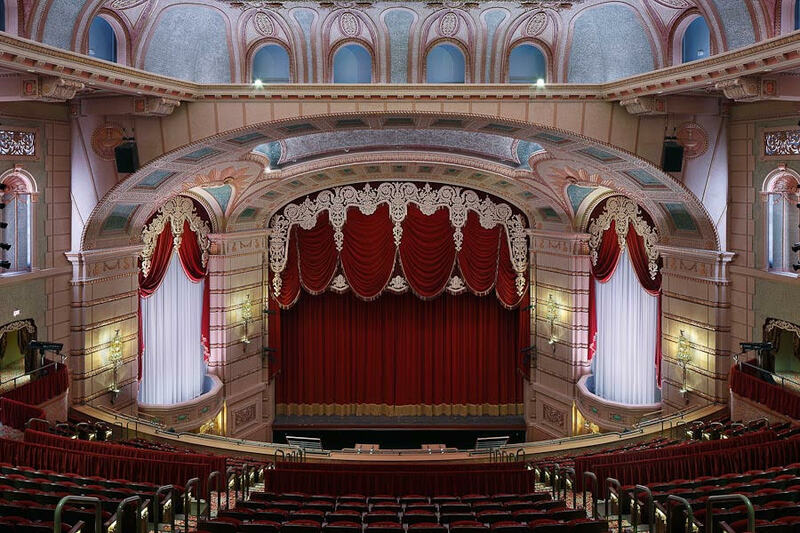 So friends, take a look at these gorgeous photos of the amazing, spectacular, too-beautiful-for-words Paramount Theatre, and then imagine being in the house for four nights of world-class juggling shows and championships during the IJA festival next summer. As someone who has attended 23 IJA festivals, I assure you that the Paramount Theatre is probably the most beautiful — and also, one of the most intimate large theaters — we have ever had the luxury to hire. But don’t take it from me! Our festival director, Dan Holzman, a professional working juggler for more than 30 years, also says the Paramount Theatre is an eye-popper — probably the most beautiful theater HE has ever been in, too! The competitors and artists who will perform on the Paramount stage this summer will be working to thrill you inside what is certainly one of the best theaters we have ever had for our festival. COMING NEXT MONTH: The story of the Paramount Theatre’s (and Cedar Rapids’) most-recent near-death experience. Learn about The Great Flood of 2016, and how the citizens of Cedar Rapids saved their city from the waters of the Cedar River and SAVED OUR FESTIVAL! Watch for it in next month’s eNewsletter! I recently went to a gala fundraising evening for the Montreal based Les Sept Doits de la Main circus collective. We saw the group’s latest show “Reversible” followed by a reception and lively auction. “Reversible” is a show based on family memories that the audience views through the window of the performers. The stage was bare, except for movable walls on wheels that could be moved to configure different rooms as backdrops and props to move from and through. There were various circus disciplines on display, such as a climbing pole, silks, hula hoop, ball juggling, whips and fans. All the different tricks were melded together with constant motion by the troupe. A featured artist would be supported by complementary movement by other artists. It was almost a surprise when a solo routine was presented. One artist presented juggling tricks with up to seven balls. I thought that the other movement on stage somewhat took away from a focus on the juggling. It was difficult to know what to concentrate on. At the end of the routine the juggler was alone for the big numbers, and the audience was impressed. But did they really get full benefit of the lead up of simpler juggling? Likewise, a girl presented a poetic contact juggling / rhythmic gymnastic routine with large red balls that ended with a five ball cascade. Was it juggling, or movement? Did the slow five ball cascade really fit with the elegant contact part of the routine? The dance world has been struggling with the definition of “What is Dance?” for years. The circus world is taking the technical disciplines to new heights by adopting movement that contemporary dance has long been experimenting with. The end result is a performance which challenges our expectations in interesting ways. The IJA Video Tutorial Contest has been running since 2010. This popular contest has amassed 291 videos to date, all of which are available for viewing on the Internet. See a full description of this year’s videos, meet the judges, and see their comments about each video on eJuggle. Below is a list of some upcoming juggling festivals. For a list of even more fests, check the worldwide juggling event listings on our website at: dev.juggle.org/events.